A commemorative paving stone is set to be unveiled to honour the memory of South Tyneside Victoria Cross recipient, Private Thomas Young. A special ceremony will take place on Tuesday (27 March) marking the 100th anniversary of Pte Thomas Young's act of gallantry that won him the prestigious Victoria Cross during the final year of the First World War. He saved nine wounded men from the front line in France. The new memorial will be unveiled by a civic dignitary at 11am, at the war memorial site in Cotswold Lane (near Asda Boldon) in Boldon Colliery - Pte Young's birthplace. This will be followed by the laying of wreaths by the Mayor of South Tyneside Councillor Olive Punchion, Major Chris Lawton, of behalf of Pte Young's old regiment, Durham Light Infantry (DLI) and a family representative. The Mayor said: "Pte Thomas Young showed complete disregard for personal danger but incredible bravery in the most harrowing of circumstances. His service in the war is held up as a magnificent example of courage and devotion to duty, and it is only right that his selfless act of valour is commemorated in his place of birth. "This memorial stone will provide a lasting legacy to Pte Young and a place for local people to remember him and pay their respects." The event will also include prayers of dedication and remembrance and will end with the 'Last Post', a minute's silence, then 'Reveille', played by DLI buglers. The Mayor will be joined by Mayoress Mrs Mary French as well as local councillors and members of the Armed Forces community, including serving soldiers from DLI. Councillor Ed Malcolm, Chairman of South Tyneside's Armed Forces Forum, said: "The Victoria Cross is the highest award in the UK honours system, awarded for gallantry 'in the face of the enemy'. This will be a very poignant event, remembering the bravery of such a celebrated local hero. "This new memorial is a fitting tribute to the centenary of the war and will help to keep Pte Young's memory alive for 100 more years to come. It is important that we make sure his selfless actions are never forgotten." Pte Thomas Young was born Thomas Morrell in Boldon Colliery in January 1895. He worked as a miner at High Spen Colliery in Durham, but served as a stretcher bearer with DLI during the First World War. 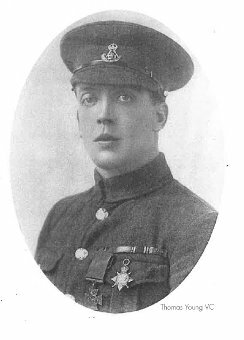 He was honoured with the Victoria Cross for his bravery in March 1918 when he saved the lives of nine men at Bucquoy, France. On that day in broad daylight, he left his trench under heavy fire to bring wounded men from the front line and into cover. King George V presented him with his Victoria Cross at Buckingham Palace in June 1918. After the war, Pte Young went back down the pit. He died in October 1966, aged 71. A statue of Pte Thomas Young stands in South Shields Town Hall. A commemorative stone to mark the centenary of the brave actions of Pte Henry Robson was unveiled in Robson Way, South Shields, in December 2014. Joseph Henry Collin of Jarrow will be honoured next month. Councillor Malcolm added: "This year is a hugely important year for the Armed Forces, marking the centenary of the end of the First World War. It will give us all an opportunity to honour the local heroes and the sacrifices they made for their country and acknowledge the huge impact this conflict had on local communities."